Which Kind Of Chocolate Is Scientifically Proven To Be Good For Your Bones And Your Health? When cold weather sets in, there’s nothing like curling up with a cup of hot cocoa. But did you know that chocolate has a rich and intriguing history? As a matter of fact, the ancient Aztecs would say you’re drinking (or eating) money! From an ancient form of currency to modern recognition as a superfood, chocolate is a rich source of antioxidants and provides many health benefits for just about every body system, including your bones. Intrigued? Then let’s explore this sweet, delicious treat! It’s been suggested that the old saying “as American as apple pie” would be more correct if it referred to chocolate cake instead. After all, apples and pies were common fare in Europe, but chocolate is a uniquely “New World” food – specifically, Mesoamerica. Mesoamerica is a geographical region that includes central Mexico, Belize, Guatemala, El Salvador, Honduras, Nicaragua, and Costa Rica. Before the Spanish colonization of the Americas in the 15th and 16th centuries, these indigenous civilizations domesticated foods that are familiar to us today: beans, tomatoes, maize, and, of course, chocolate. They used the beans (seeds) of the cacao tree to make fermented beverages and a foamy, bitter drink of ground cacao beans mixed with spices and other foods. Residue of chocolate beverages has been collected from ceramic vessels dating all the way back to 1900 B.C. In southern Mexico, similar drinks called “Chilate” are still enjoyed today. The cacao tree itself produces these coveted beans inside long pods, each containing about 35 cacao beans in a thick, pulpy mass. While the beans are very bitter, the pulp is quite sweet. There’s even evidence that this pulp was fermented by to make mankind’s first alcoholic beverage! 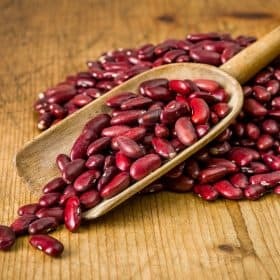 The ancient Aztecs acknowledged the beans as a gift from the god of wisdom, and they were highly valued and used as a form of currency. The Mayan people also connected chocolate with a deity– specifically, cacao beans were thought to be the food of the rain god Kon. When Europeans were introduced to this irresistible bean, they added sugar. And it’s believed that the first spelling difference took place in Europe: “cacao” was accidentally noted as “cocoa” by a merchant involved in the cacao trade. Perhaps because it was easier to pronounce, the name stuck, and today we distinguish between cacao and cocoa as different forms of the same product (more on that in a moment). Chocolate grew in importance and popularity in Europe and eventually the United States, and it became a staple food. Chocolate was even included in soldiers’ rations during wartime. Current research supports the notion of chocolate as a staple food that could be consumed daily, albeit in small amounts and in the right form. Before we delve into the various forms of chocolate, let’s take a moment to dispel a myth that came about due to a flawed study on chocolate consumption and bone density. Study Finds That Chocolate Decreases Bone Density – Is It True? If you’re following the Osteoporosis Reversal Program, then you know that dark chocolate is listed as a Foundation Food. Yet a published five-year study on the link between chocolate consumption and bone density basically placed it in the realm of “junk food”. But, as you’ll see, the study is clearly flawed. A group of women between the ages of 70 and 85 were randomly selected from the general population and given bone density scans. They were then asked about their frequency of chocolate intake. The women who reported consuming chocolate most frequently (more than once a day) were found to have lower bone density and strength than those who ate chocolate less frequently. Incredibly, the study authors themselves admit that “The current study has certain weaknesses.”1 That’s putting it mildly! First of all, the amount of chocolate the women consumed is not mentioned; only the frequency. But it is crucial information. For example, if the women ate chocolate more than once a day, that could simply mean they ate two or three mini chocolate morsels four times a day, whereas those who consumed chocolate only once a day might have been eating an entire candy bar in one sitting. Also, “Diet, lifestyle, or environmental factors that were either not measured or inadequately measured may account for the relation”1 between chocolate consumption and low bone density. In other words, we have no idea if these women were couch potatoes or athletes. We don’t know if they were balancing their chocolate intake with alkalizing foods, or if they ate a predominantly acidifying diet. We don’t have any idea what their environment was like – were they indoors most of the time? Exposed to fresh air and sunlight? Also, the study does not mention if the women were taking supplements or medications. All of these factors can significantly influence the study outcome, but one of the most shocking flaws is the neglect by the researchers to denote the type of chocolate the women consumed. By “chocolate,” did the women mean they ate artificially flavored chocolate, which is really flavored oils without very little cocoa in it? Or did they consume milk chocolate candy bars, unsweetened cocoa powder, or 85% cacao chocolate? What was the sugar content of the chocolate consumed, and did it contain high fructose corn syrup? 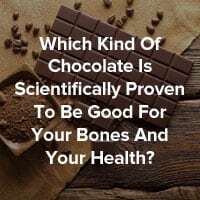 The reason this particular flaw is so significant is because the sugary, artificial junk that passes for “chocolate” is terrible for bone health, and is in direct opposition to dark chocolate, which is good for your bones and your overall health. What Kind Of Chocolate Is Best? There is a vast difference between processed, milk chocolate candy bars and polyphenol-rich dark chocolate. So what’s the problem with milk chocolate? Besides the already known detrimental effect of milk on bones, its protein binds to the antioxidants that make chocolate healthy, preventing their absorption, and therefore undermining one of the primary health benefits of chocolate. Processed chocolate is loaded with sugar, including high fructose corn syrup, and typically contain preservatives, artificial flavors, colors, and hydrogenated oils. This is particularly true of mass-produced, inexpensive chocolate-flavored treats that appear in stores during holidays. On the other hand, organic, dark chocolate that’s at least 70% cacao and contains no artificial additives is a healthful treat. Better yet, choose raw cacao that doesn’t contain sugar. It’s important to clarify the difference between these two terms, even if the original spelling difference was a slip of a merchant’s pen.The Latin name for the cacao tree is Theobroma cacao, and the pods and beans are called cacao beans. So “cacao” generally refers to products that are as close as possible to their raw, unprocessed state, straight off the tree. Cacao butter is the fat that occurs naturally in the outer lining of the cacao beans. Once this is removed, the cacao bean can be finely ground into raw cacao powder (not to be confused with cocoa powder, which has the fat removed). Cacao nibs are dried cacao beans that have been chopped up, and cacao paste is made from pulverized nibs that have been melted slowly over low heat. The term “cocoa” refers to cacao that’s had the cacao butter removed and has been heated and ground to a powder. This is the most common form of chocolate, predominantly used to make hot chocolate and for baking. Cocoa without added sugar, fats, and other additives (stay away from “instant” chocolate milk and hot chocolate mix) is healthful too. Despite the higher temperatures involves in processing, cocoa retains most of its antioxidants. Dutch-processed cocoa has a richer, less acidic taste because it has been processed with an alkalizing solution. It’s still acidifying to the body, though, as is all chocolate, which brings me to the next very important point. All forms of chocolate are acidifying. But as you will soon see, thanks to its rich nutrient content, you can enjoy it – even every day. Besides, the Osteoporosis Reversal Program is not about avoiding acidifying foods; it’s about balancing them with alkalizing ones to maximize your intake bone-building nutrients. Chocolate is meant to be eaten in small amounts. A piece of dark chocolate about one inch long and ¼ thick is ideal, and if you eat this small piece slowly about half an hour before a meal, it produces a sense of satisfaction that helps prevent overeating. Eating another small piece after the meal also helps stop your appetite before you eat too much or head for a big dessert. This fits perfectly with the 80/20 nutritional plan that forms the basis of the Osteoporosis Reversal Program. These small pieces of chocolate make up part of the 20% of acidifying foods that are included in the day’s food choices. The same is true for cocoa. Given chocolate’s amazing nutritional and phytochemical profile, which we’re going to look at next, it makes sense to include this delicious food in your daily menu. Theobromine and caffeine. These two chemicals work together to give you a sense of increased energy after eating chocolate. Phenylethelamine is a relative of amphetamines and a stimulant, helping you stay alert and focused. Anandamide is a neurotransmitter manufactured in the brain that’s also present in chocolate. It produces a pleasant sense of happiness, and other chemicals present in the chocolate slow the breakdown of the anandamide, so the good feeling lasts longer than positive feelings produced by other neurotransmitters which are processed very quickly in the body. Antioxidants levels can be measured by the ORAC method, or Oxygen Radical Absorbance Capacity. This is a measure of how much antioxidant activity is present– in other words, how well the food disarms free radicals. Catechins, which stimulate osteoblast activity and perform a host of other roles in the body. Oligomeric procynanidins are found in higher concentrations in chocolate when compared to other foods, including cranberries and green tea. Resveratrol actually improves balance and motor coordination in addition to its many other healthful benefits. In addition to these bone-building substances, chocolate also contains iron, magnesium*, copper*, manganese*, potassium, phosphorous, zinc*, and selenium. Now you can see why chocolate is a Foundation Food in the Program! There are other substances in chocolate that bear mentioning: oxalates and phytic acid. Oxalates and phytic acid are substances that bind to minerals, including calcium, making them less bioavailable. While it’s true that chocolate contains oxalates, the reality is that you should consume it in small amounts, especially in comparison to other foods high in oxalates, such as spinach, kale, and beets – to name a few. So the bottom line is, chocolate is a bone-smart food, and its oxalate content needn’t stop you from including it in your diet. And the same applies to phytic acid. Also, bear in mind that chocolate’s benefits extend beyond bone health, as you’ll read next. Your skeleton isn’t the only body system to get a boost from chocolate. Here are some other benefits to consider. It’s well-known that the antioxidants in chocolate produce an anti-inflammatory effect, which is the main culprit behind cardiovascular disease. High blood pressure can damage your bones and your kidneys, allowing bone-destroying toxins to build up. Chocolate helps arteries relax by stimulating the lining of the arteries to produce nitric oxide. This substance “tells” blood vessels to relax. So chocolate is good for your brain! It may come as a surprise that chocolate plays so many important roles in the body. It’s remarkably versatile in the kitchen, too – it can be consumed in various forms well over and beyond the inch-long piece I mentioned earlier. For example, unsweetened cacao or cocoa powder can be added to many different dishes, boosting their antioxidant content without added sugar. I love to sprinkle my breakfast oatmeal with dark raw cacao or you can make sweet, bone-healthy brownies. You’ll find even more chocolaty recipes and ideas in Bone Appétit, including one for Heavenly Chocolate Cake (page 122) that tastes so sweet and decadent you’d never know it’s sugar-free. And how about chocolate for breakfast? “Ooh Lala” French Toast (page 9) features chopped dark chocolate inside the toasted sandwiches. Bone Appétit has many other chocolate dishes included in its 200+ recipes. There’s Non-Dairy Chocolate Delish (page 129) and Choco-Banana Delight (page 133). 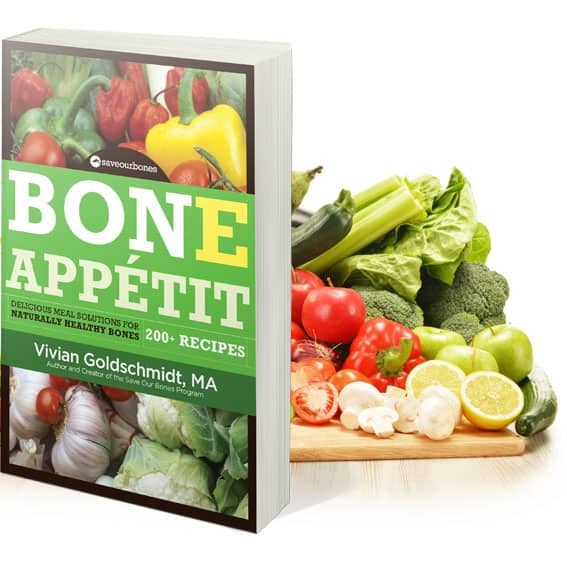 The latter recipe is featured in Quick Picks, a collection of super-fast, bone-smart foods included at the end of every section for those days when you’re short on time but still want to eat foods that build your bones. As you can see, chocolate definitely has a place in a bone-smart diet! So go ahead and indulge (in moderation, of course), knowing you’re doing something healthful for your bones, brain, heart, and so much more. 4 Nogeuira L, Ramirez-Sanchez I, Perkins GA, Murphy A, Taub PR, Ceballos G, Villarreal FJ, Hogan MC, Malek MH. “Epicatechin enhances fatigue resistance and oxidative capacity in mouse muscle.” J Physiol. 589. Pt 18. (2011): 4615-31. Could you recommend a brand of chocolate that you feel is the best dark chocolate? Which one do you eat? Thank you! 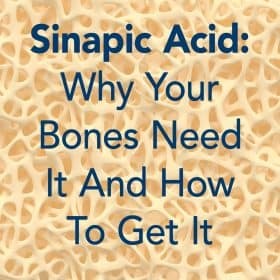 Could you give me your opinion on how phytic acid impacts bone health and what phytic acid foods we should avoid? I’m sorry if you’ve already addressed this somewhere else. Someone mentioned the fact that most, even organic, chocolate candy has cadmium & lead contaminants – not minerals I for one want to eat. I love good dark chocolate, but there are only a very few bars from common brands free of these toxins. And the tests were done several years ago so who knows if the results are still valid? Any comments are appreciated. That’s what I read in Consumers Lab so I worry about that. I do try to pick brands they list that have lower amounts of cadmium but as you said it’s limited. Hi. Does anyone know a web site that tells you the oxalate content of Dutch cocoa? I know regular cocoa is very high. I am trying to find out if Dutch cocoa has high oxalates just like the regular cocoa does. If anyone can find a web site that states this please let us all know! Yes I, too, would like to know what brand of dark chocolate you use. I have found it hard to find chocolate that doesn’t have corn syrup in it. Please see my reply to Claire. It’s not chocolate candy. I make my own “candy” from it because as you say, all of the candies have something in them that I don’t want to eat. I had to a change my tastes and it took only a few weeks, fortunately. I apologize for challenging you like this, but I don’t get it: You made the case for why dark chocolate is good for cardiovascular health, anxiety, blood pressure, and skin, BUT I don’t see the proof of your main point: where did you make the connection to it being “scientifically proven to be good for your BONES”? I agree it’s good for many aspects of our health, but where is the scientific back up ( or any back up) showing its good for our bones? If you’ll take a look at the list of antioxidants, you’ll see that these are the key nutrients that make chocolate good for bones. 🙂 Reducing oxidative damage to bones is vital in reversing bone loss and building new bone. Consumerlab.com has a chart showing which sources of chocolate have the highest levels of flavanols and which have high levels of cadmium which is toxic. I found a lot of unfortunate surprises there. As a result of this information, I made another choice of chocolate and invented a special treat for myself using it. Please share the type of chocolate you use and the recipe you make. I, too, have read consumerlab.com and am still confused about chocolate. I now use Baker’s Unsweetened Baking Chocolate Bar 100% cacao. It was the best compromise. It’s not candy of course. I make my totally healthy very dark chocolate treat from it – one serving at a time. If you are looking for a sweet chocolate “candy” this probably won’t do it for you, but gradually over the years I have changed my tastes and I enjoy this. It’s chocolate in a big way and satisfies me. Everything is approximate since I don’t really measure any of it and there is plenty of room for alterations to suit your tastes. In a microwave glass dish, I melt about 1 1/2 squares of the chocolate and a teaspoon of cocoanut oil. Microwave on high for about 2 minutes or so. Spoon the mixture onto a piece of parchment paper or foil (on a small pan or dish) and put in the freezer for 5 or 10 minutes. Eat directly from the freezer. Thank you. 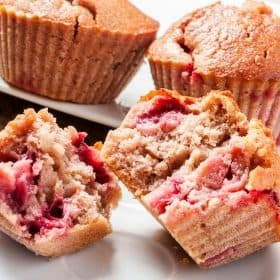 I make it frequently as a quick and easy treat that can be varied day to day. Probably cocoanut sugar would work too but I have tried to stay away from sugars. Thanks to your diet among other things, my DEXA is up out of osteoporosis at last so I’m continuing to do what is working for me. Some time ago I asked my integrative medicine physician in S Africa how much 70% dark chocolate I could eat per day. He suggested 2 – 3 pieces. I enquired re the size of the pieces (which vary according to the brand). He said it could apply to Lindt chocolate, which comprises 10 pieces in a 100g slab. This implies 25 g/day, which exceeds your recommended limit of 2 pieces (1 before and 1 after supper) of 1 x 0,5 x 0,25 inches which I estimate to amount to only about 10g/day….. Some people get migranes from dark chocolate. Is there a form of it that doesn’t cause migranes? I get headaches from dark chocolate and milk chocolate but not the white chocolate…….I only eat a couple of small squares but it triggers a headache just the same. Don’t crave chocolate so unless I get it as a gift I am happy to not have it. That’s because “white chocolate” really isn’t chocolate at all. It’s just a name. Interestingly enough, studies have failed to solidify a connection between chocolate consumption and migraine headaches. If you suspect that chocolate is triggering a migraine, then keeping a food diary is a good idea. There may be other ingredients in the chocolate that cause the migraine, or you might crave chocolate and sweets right before a migraine comes on, in which case you’d get a headache whether you ate chocolate or not. I very carefully read your chocolate report. You suggest one should eat a ” 1 inch long and 1/4 inch thick ” piece of at least 70% dark chocolate. You only gave the length and thickness of the piece, but not the width!!! I very happily would eat a 1″ x 4″ x 1/4″ piece! Ha Ha. Did you mean “a 1 square inch and 1/4 inch thick piece? I travel a lot and used to drink caffeinated soda to keep me awake. (I do not like coffee.) Now I eat 70% dark chocolate and alternate water and unsweet tea. As usual, you hit the nail on the head, Vivian. Chocolate surely does keep a person awake! Thank you for the article, Vivian! I am a chocolate lover and appreciate very dark chocolate almost daily. I’m glad I can continue enjoying it. 🙂 I agree that eating it in the right amount, and in high quality is the key to make the most of its beneficial properties. I wonder if you have any ideas on chocolate and phytic acid which inhibits calcium absorbtion. My guess is that if we have a balanced Savers’ program, then the consuption of other nutrients neutralizes the efect of the (probably not too large) amounts of phytic acid in the piece of chocolate/cocoa we consume. Any ideas on this? another consideration for the type of chocolate consumed is whether it has been treated with an alkalizing agent (i.e., Dutch Processed). This process removes flavonoids, which while bitter are also powerful antioxidants. So knowing that the chocolate is ‘dark’ only tells you it is low in sugar. The only way to know whether chocolate has been so processed is to look at the back of the label. It is difficult to find non-alkalized dark chocolate, but it does exist. (refs: http://www.ncbi.nlm.nih.gov/pmc/articles/PMC3215931/, http://www.ncbi.nlm.nih.gov/pmc/articles/PMC4145303/).